Since the turn of the millennium, the Coup's albums have been few and far between, as they released Party Music in 2001 and then Pick a Bigger Weapon in 2006. Now, the group have announced that their long-awaited new album, Sorry to Bother You, will drop on October 30 via Anti-. 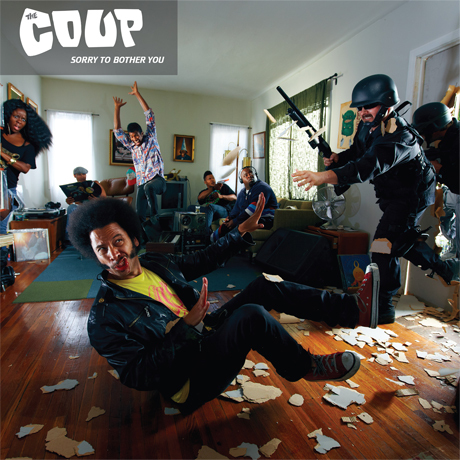 Much like the Coup's past work, the album looks to be a politically minded affair. According to a press release, "The tracks merge danceable beats, punk urgency and the astute social commentary of hip-hop to craft a refreshingly unique sound that draws from the past but never sounds anything but futuristic." Sorry to Bother You was co-produced by the Coup leader Boots Riley, along with Damion Gallegos, who employed "incongruous styles" and "unconventional recording techniques" in order to bring the lyrics to life. Guests include Das Racist, Anti-Flag, Killer Mike, Jolie Holland, Japanther, Vernon Reid, Joe Henry and more. Riley said in a statement, "You hear a lot of early punk and eighties music in this record -- but, for the most part, we didn't realize that as we were making it. I like music that is aggressive but that you can also dance to. Some times those things are considered to be in different categories, but I try to mix them. I also wanted the album to sound rough. I think sometimes music these days is so perfect and predictable that it almost cancels itself out. Maybe if there's some tension people will hear it better." Lead track "The Magic Clap" is streaming at the bottom of the page, so scroll past the tracklist to give it a listen.